What about milk that is PINK? | Why Do We Do It? 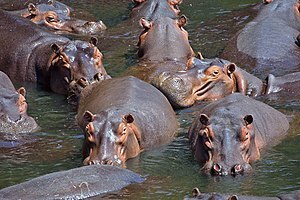 The hippopotamus or hippo is an animal that produces pink milk. It also produces a pink mucus that it uses to protect its skin from sun burns. Well, but anyways, now we know that hippo milk is pink.. This entry was posted on March 24, 2011 by Avi. It was filed under 2011, March and was tagged with Breast milk, Dairy, Dairy Products, Effects, Health, hippo milk, hippopotamus, hippopotamus milk, Lactose intolerance, Milk, milk pink, pink milk, Specific Substances.